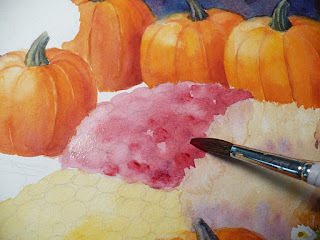 Recently, my watercolor students have been painting Autumn scenes. This means pumpkins and chrysanthemums are included. 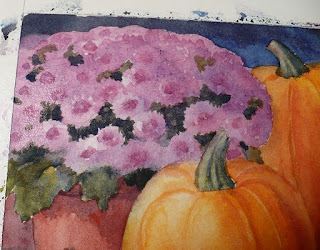 They particularly wanted to know how to paint mums which can seem difficult at first because they are a mound of color broken up into individual flowers. You may be wondering the same thing. So, let's take a look at how I painted the mums in this scene. When I paint a pot of mums, I begin with a wash of a single color like autumn pink, rusty red, orange or yellow. 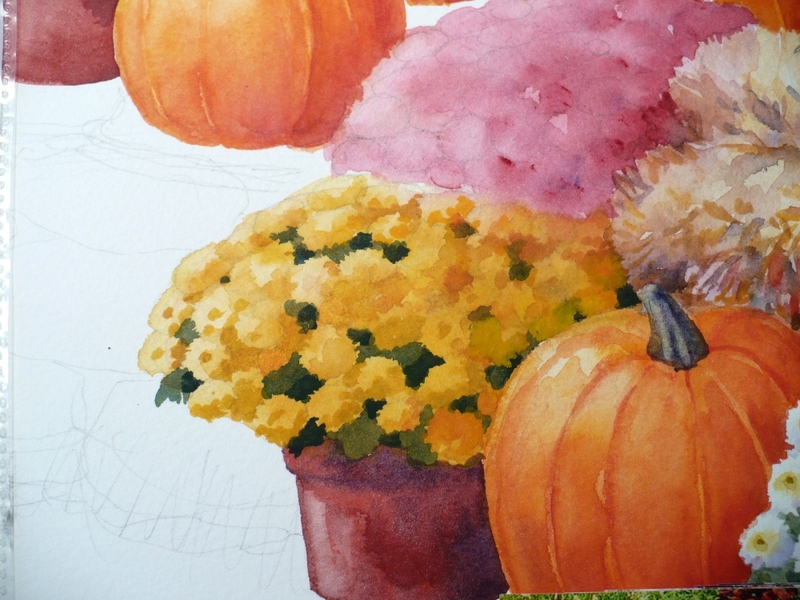 I won't use orange mums in this piece because there are already so many pumpkins and more orange would be overwhelming. To the left, you see a dried wash of pink where some mums will be. 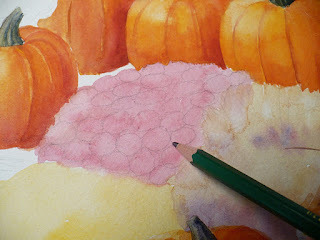 I find it helpful to draw in some circles to define the individual flowers. Note that the circles are narrowed to ellipses at the top of the mound. Now the mums are ready for more detail. So I wet the pink mound with water and drop in deeper color on the shadow side. This rounds out the form. If I determine where the light is coming from before painting, I will always know which side is in shadow to keep things consistent. 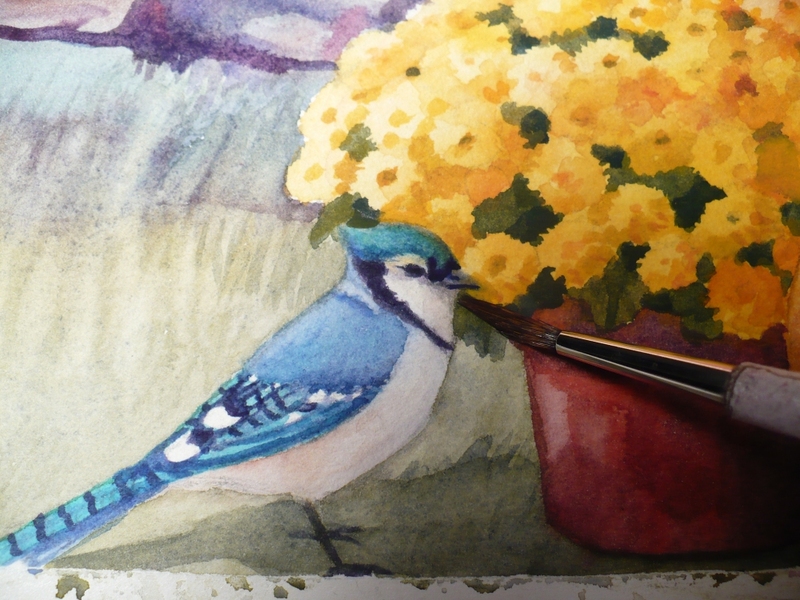 And I'll add shadows to the yellow flowers too. 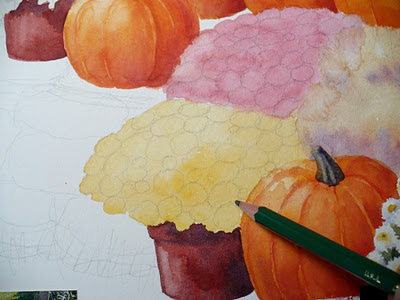 When the shadowing is dry, I add some green leaves. The flowers are not totally a solid mass, so the green will peep through here and there defining the edges of the flowers. I make sure to show rough petals on the edges since the flower edges will not be smooth. You can click the images to see this larger. 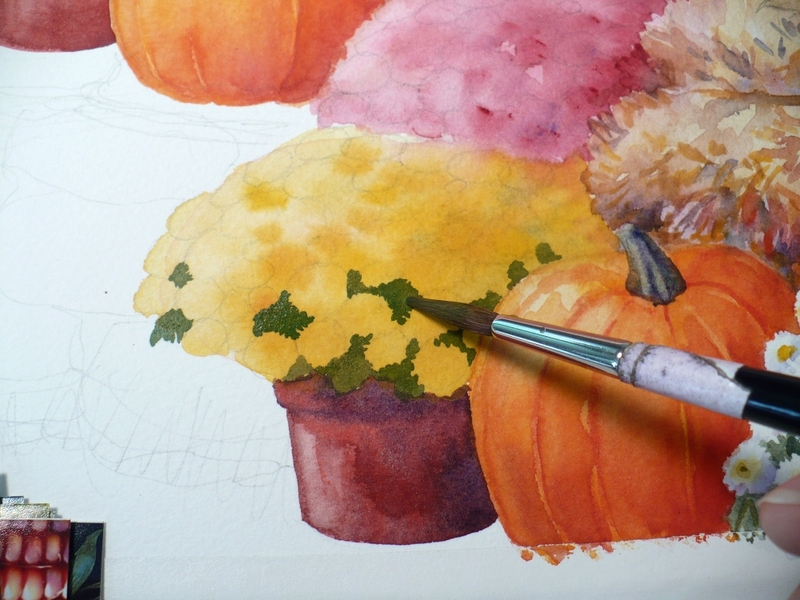 After that, I paint a bit of detail into the flowers. Now, I'll just repeat these steps with the remaining mums. Here is a white one with yellow centers. Notice the bluish shadows on the right. Here is a pale pink one with deeper centers. I don't get very detailed with the flowers and leaves, I just want to give the impression of flowers in this painting. 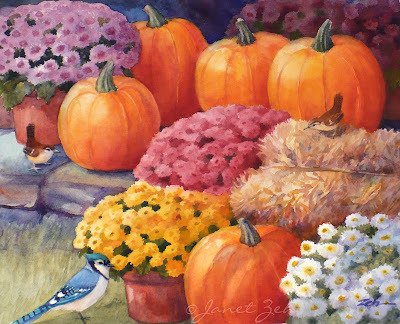 The softness of the flowers is a nice contrast to the hard smooth edges of the pumpkins. I decided to add some birds. 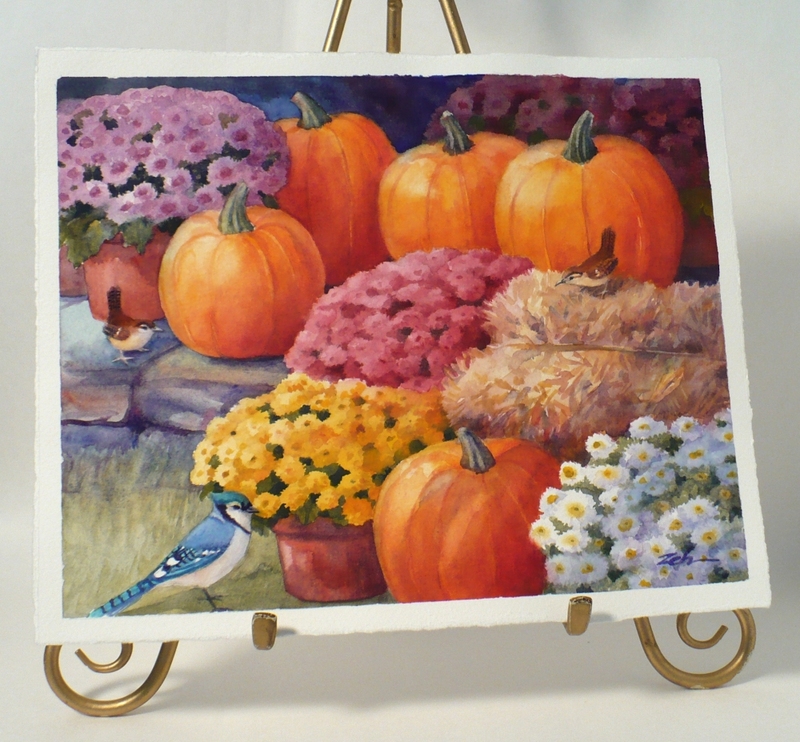 The light is slanted and the colors warm in this piece giving the impression of early evening. So the birds have arrived after everyone has gone home to their suppers. First I paint a blue jay in the foreground. I love the blue colors! Next, I paint a little wren standing on the hay bales. 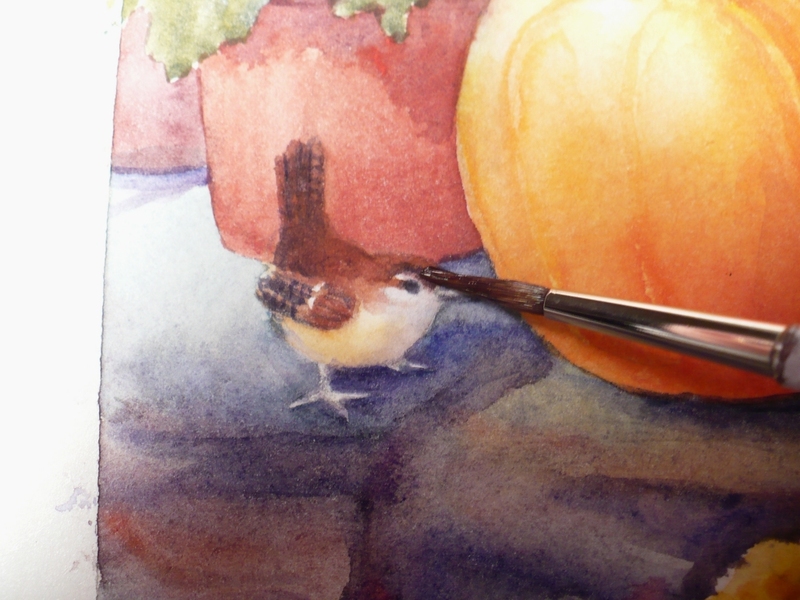 And then another little wren on the stone wall. 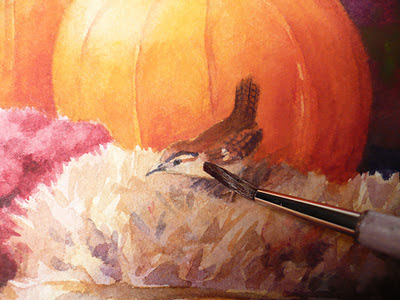 Once the birds and the background colors are done, the painting is complete! 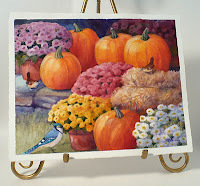 Pumpkins, Birds and Mums original watercolor painting is for sale in my Original Art shop here. Hope you enjoyed the demo and thank you for stopping by. 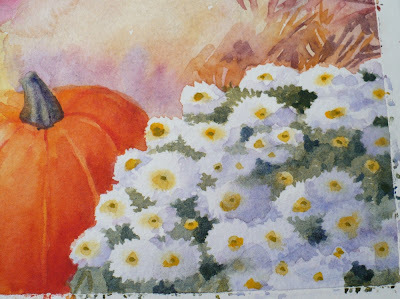 Thanks for the demo…it has helped me as I am painting a similar scene I just photographed and was wondering how to do the mums! You're welcome Sarah. Good luck with the painting!